The gas alarm system type GPM-03R is used where multiple detection points are needed, requiring three or more gas detectors. The modular construction is placed in a 19” rack for mounting in a steel cabinet. 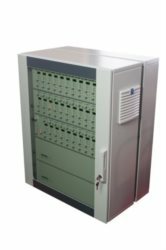 It includes control units (watchdog and common unit), line units, relay circuits, power supply and detectors. As an option, we can offer separate relays for the individual lines/detectors. The power supply is available with or without UPS.